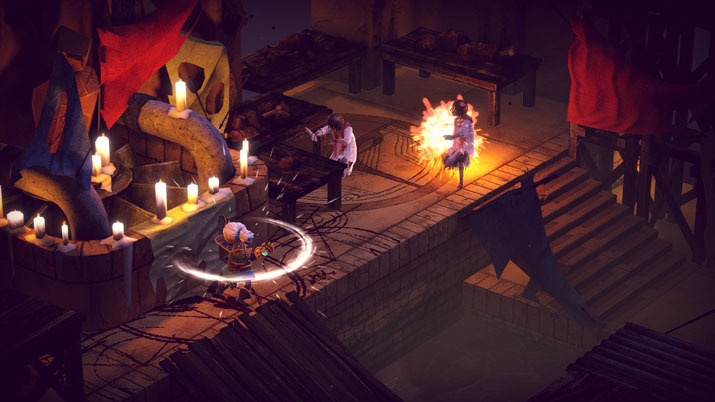 Children of Zodiarcs brings grid-based tactical RPGs into the new century. Cultivating cultures of inspiration drawn from the old tactical titles of yesteryear, Children of Zodiarcs (CoZ) successfully blends tactical combat, deckbuilding, and dice-rolling into a coherent, streamlined title that is at once novel and timeless. Cardboard Utopia, a small indie studio, developed CoZ under the guidance of Square Enix Collective over the course of three years, funded by a Kickstarter campaign raising over a quarter million dollars. hildren of Zodiarcs offers an engaging new take on an old system, giving fans of 32-bit tactical games the same experience they crave when firing up their ancient copy of Final Fantasy Tactics. The story centers around a gang of thieves who’ve stolen an ancient relic and are now on the lam. Along the way, you play as a core group of characters, dodging myriad enemy squads, leveling up, guiding decks and dice -- and getting know the gang. Dialogue is dry, almost self-referential at times, capturing the same, overly-dramatic, bland exclamation of older games [EN: Just south of the Eastern Woods of Westlandershire!]. However, the story has enough momentum to carry you moving forward; the characters develop in the right ways, and objectives are clear at all times. However, most of the propulsion happens because the mechanics are wondrous and well-crafted. Children of Zodiarcs not only adopted, but honed the classic tactical style we remember from the PS1 days. Much of the irksome camera angles, UI clunkiness -- that is, the tedious frustrations with which we’re all-too-familiar -- are ironed out, adapted for a modern audience. What you’re able to do is clearly presented to you, and movement is non-binding until you make an action, allowing you to find the right place to launch your ability. Positioning is crucial, and maps are designed to create choke points and dynamic tactical choices. Not all choices should be made with damage in mind though, as the enemy will quickly overwhelm you if you are not mindful of the other factors at play. Character spells and abilities are all linked to cards drawn over the course of play and can be used to tailor each character to a specific combat role. Decks are built outside of combat and, with the built-in recommended deck feature, is a hassle-free process. This feature offers a general by-the-book deck for each character. Each character has a deck with a minimum of 18 cards, each card representing a particular ability for your character. Generally, each spell and ability has multiple cards you can put into your deck for recurring use throughout combat. During combat, cards are used just like abilities in most games, except your rate of depletion is measured by the size of your hand. Each turn in combat, your characters have an option to draw two cards (up to seven total); additionally, cards can be gained through dice rolls. The dice system is really where this game starts to shine. At first I wasn’t so thrilled about having to roll dice on a computer screen, but once the beauty and elegance of the system revealed itself, I became a convert. Each character has a number of dice associated with him or her. Each dice has a particular group of symbols on it, linking them to the abilities and triggers on the cards. After you play a card you will roll your dice; depending on which symbols you roll your card will either increase in strength, gain a trigger ability, or some other secondary effect, adding a great deal of variety and strategy to the card system. You also have the option to re-roll any two dice of your choice, giving you a slight statistical edge. 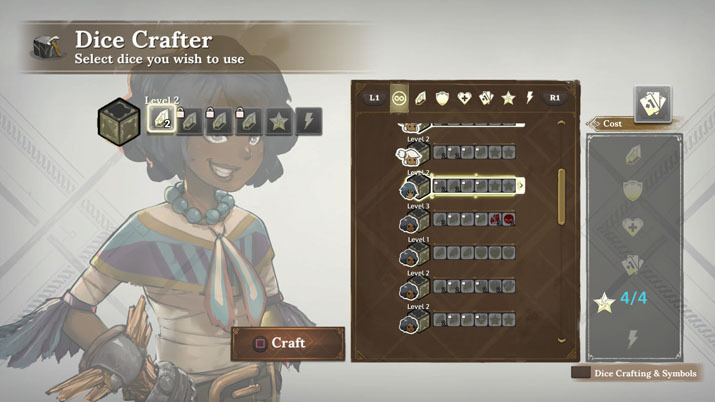 Once you hit Act 2 of the game, you unlock the ability to craft your own dice, altering the symbols on the dice to uniquely tailor your characters to your strategy. The combination of grid-based combat, cards, and dice systems all in one game sounds like a player’s dream and a developer’s nightmare. Cardboard Utopia have not only managed to create an entertaining tactical title; they have also managed to fuse three different kinds of gaming experience into one orchestrated masterpiece. Children of Zodiarcs has the instant appeal of nostalgic tactical games like Final Fantasy Tactics while also pushing the genre forward by streamlining the tactics system for the modern gamer, and providing a fresh, dynamic element to an otherwise mostly outdated style. As Jason Kim, Creative Director at Cardboard Utopia said, “The game tells the story of a band of professional thieves on the hunt for an ancient relic,” and indeed, it seems Cardboard Utopia have created a relic of their own. Children of Zodiarcs will please you to no end and have you coming back for more, as you work to hone your deck, dice, and tactical style to best synergize your party. A must-have for tactical RPG enthusiasts, it would not be surprising if CoZ becomes a model for future tactical and card-based games over the next decade.